This is a Good opportunity for Diploma holder as well as degree holder to grab a Government job in India under DRDO department. 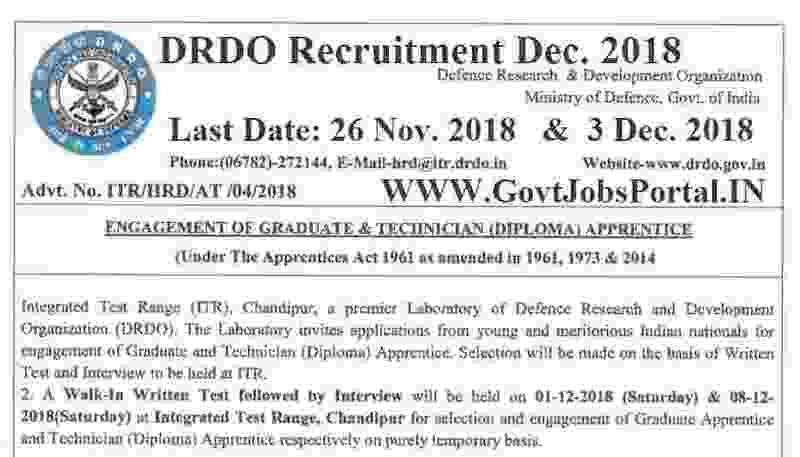 DRDO Recruitment Department is looking to heir fresher Indian candidates who have completed their diploma as well as for those who have completed their degree under Engineering stream. There are total 58 vacant positions which are going to be filled up through this DRDO recruitment process. More information related to these DRDO Vacancies is given below in this article. We shared full information related to the eligibility criteria and other conditions below in this post. Read it carefully before applying. Education: BE/B.Tech Pass Out in the relevant stream can apply for this DRDO Recruitment process 2018. Education: Applicants have diploma in the relevant stream can apply for this DRDO Recruitment procedure. DRDO is inviting all eligible Indian applicants to apply for this recruitment procedure for free of cost. That means no need to pay any application fee for applying these job profiles. 26TH Nov. Last Date for the Submission of Application. 3rd Dec. 2018 is the Last Date for Submission of Application. 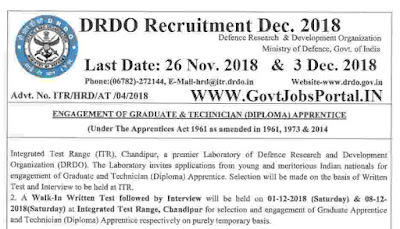 Concerned & Qualified applicants may send the scanned copy of the prescribed Application Form attached with the official advertisement whose link we share above under IMPORTANT LINK section by E-Mail to hrd@itr.drdo.in on or before 26.11.2018 for Graduate Apprentice and 03.12.2018 for Technician (Diploma) Apprentice.